TWO WAY STRETCH! 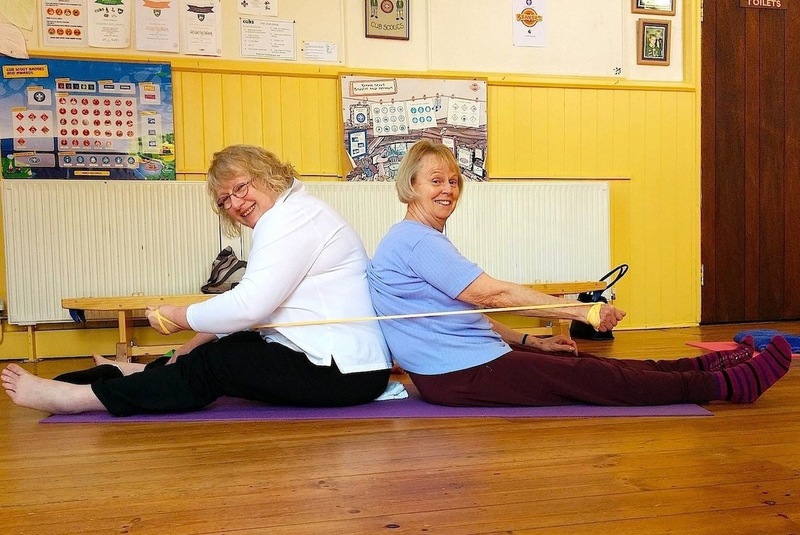 Pilates regulars Imelda Walker, left, and Vivienne Bale prove that fitness can be fun while exercising with a giant rubber band during their popular weekly class at Southwick. Fitness with fun! That’s the winning recipe for the Pilates group, which offers wonderfully gentle exercise for members of almost any age and fitness level. Instructor Claire Gregory focuses on balance, posture and breathing – and, crucially, most of her exercises can be tailored to individual need, with members using chairs if necessary. To ensure we’re getting it right, Claire tours the class regularly, monitoring our every move and giving advice. And her light-hearted approach brings out the very best in the 16-or-so regulars who meet on Monday afternoons at the Scout Hall in School Lane, Southwick. There’s now a waiting list of members wishing to join our class – but don’t be deterred. For details, contact the Groups Co-ordinator. Or you could try Claire’s other session run by Westbury U3a on Wednesday afternoons. Contact Joy, the Westbury co-ordinator, on 01373 826766.